We recently co-hosted a free webinar on training for the Etape, La Marmotte or Maratona dles Dolomites with Dig Deep Coaching. Fitness comes from your body adapting to training stress and rebuilding itself stronger during recovery. The number one priority is consistency in training so little and often is better than weekend “junk training” that leaves you over tired during the week. Compare your form now against your form last year and act on the basis of knowledge rather than worrying where your fitness is at. If you have a regular climb that you use as a test and you use TrainingPeaks and a bike computer you can look back and select the same climbing segment and compare your VAM climbing values. Then if you are ahead or behind schedule you have a number to work from and a goal to beat. Let’s be realistic, we haven’t got time to be doing hours and hours of endurance riding in heart rate zone two. So if you are short of training time (who isn’t) then focus on Tempo rides (below or slightly above your FTP or Lactate Threshold). Your lactate threshold or FTP is your biggest limiter for climbing in the Alps. Intrigued? Find out why FTP is important and how to improve FTP. More new school coaching advice from Dig Deep Coaching! Whilst we all know that 90rpm cadence is the best for sustained climbing efforts (Hang on I did not know that – help!) one way to simulate the force required for steep gradients (like you will encounter at the Maratona dles Dolomites) is by dropping your cadence to 60 or 70 rpm whilst climbing and using a bigger gear than normal. Try alternating 60 seconds at 60rpm, 70 second at 70rpm and recovery at 90rpm. 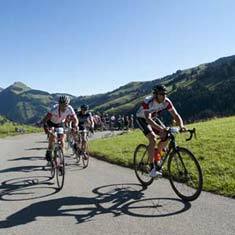 If you are training for the Etape, La Marmotte or Maratona dles Dolomites then join like minded riders on a training camp in the Swiss Alps or Italian Dolomites to prepare for your best summer of cycling ever.